Cover crops can add organic matter, increase soil fertility, and reduce erosion, among many other benefits. However, our short growing season makes getting covers established after corn harvest challenging. As an alternative, farmers and researchers alike are looking at ways to establish cover crops as the corn is growing. The first window to establish covers is just prior to corn canopy closure–at this stage of corn development, there is enough light to allow for solid seed germination. As the corn crop grows, the canopy will shade the cover crops. The cover crop growth slows but resumes after the corn harvest when the cover crop can have unfettered access to the sun. During this time of year, some farmers broadcast seed using a tractor-mounted seeder and/or mixed with fertilizer and applied at the time of topdress. However, there is new equipment available to interseed cover crops at the same time of N topdress and herbicide application. 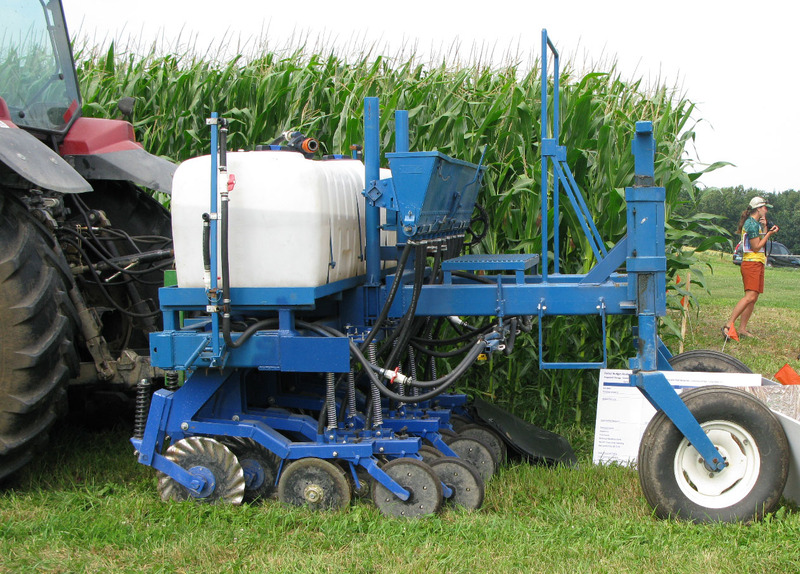 The Penn State Interseeder is designed to function like a no-till drill. As a result, the seed is incorporated and has better germination than if the cover crop was broadcast. Thus, the cost of seed is often reduced by a quarter of the amount of broadcast seed needed to meet requirements by the USDA NRCS guidelines for cover cropping. A common concern about planting cover crops this early in the season is that they may compete with the corn crop for nutrients. However, the cover crop roots are very shallow while corn roots are growing deeper in the soil profile, so the cover crops are not pulling nutrients from the same zone of soil as the corn crop. 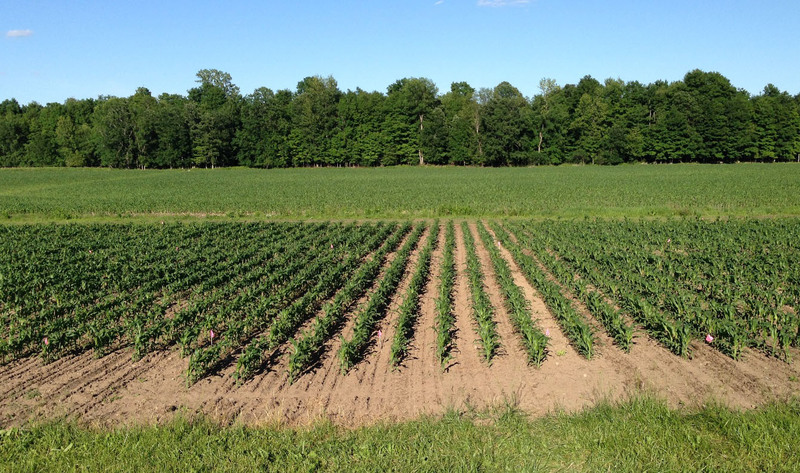 Newly planted cover crops in test plots at Borderview Research Farm (June 19, 2015). After the corn harvest, the cover crop growth resumes. The biomass increases and the roots deepen. This living crop provides an ideal mechanism for capturing the nutrients applied during fall manure spreading. Come spring time, the dying cover crop will add organic matter to your soil and the decaying biomass will add the nutrients it sequestered from last season’s manure application. More information about the Penn State Interseeder and cover crops can be found in “Under Cover: Integrating Cover Crops into Silage Corn Systems” on UVM Extension NWCS. If you have any questions, please give our office a call or email cropsoilvt@gmail.com. This entry was posted on Tuesday, June 30th, 2015 at 1:51 pm and is filed under Out Croppings, Uncategorized. You can follow any responses to this entry through the RSS 2.0 feed. You can leave a response, or trackback from your own site.